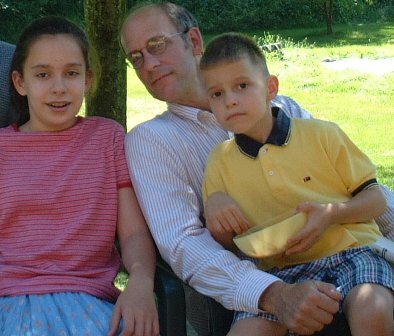 In this photo, probably taken in 2001, we see the remaining two younger children with their dad, Debra (then about 11 years old) and Seth (then about 5 years old). This entry was posted on Tuesday, September 25th, 2007 at 6:05 am	and is filed under Favorite Photos, Memories. You can follow any responses to this entry through the RSS 2.0 feed. Both comments and pings are currently closed. Aww! Seth was so cute too! He looks surprised… either that, or they’re looking at something.